Foodpanda.my now provides food delivery service to residents of Johor Bahru. The largest food delivery service provider in Malaysia just got larger. 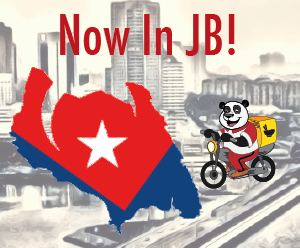 Foodpanda has just expanded its delivery service to the south most tip of Malaysia – Johor Bahru. Making this the fifth city that foodpanda has a footprint here in Malaysia. With a soft launch last Friday, Foodpanda has already received some very encouraging feedback from residents of JB. “This app really has some potential in making life easy for certain groups of people, like working people and students" says Shalin Tan, a local JB resident and new foodpanda customer. “I am the poster child for your customers - I would use it multiple times a week probably. I have been encouraging people in JB to provide delivery“ says John Hunter, an expat living in JB. Hunter adds “There is a need for decent delivery food in JB. I have told several people I thought it would be a good business to get into and I want to see entrepreneurial efforts, like this, succeed in JB.“ “We are very happy to add Johor Bahru to our list of cities that we provide delivery for” says Claudio Abitante, MD foodpanda.my. “We believe that JB is an underserved market with lots of potential. Already we are seeing very encouraging feedback from both restaurants and customers. We intend to bring our experience in food delivery and strong partner restaurants to the residents of JB” he adds. Starting with big names such as Chatime, Kenny Rogers Roasters, Vivo Pizza as well as local favorites like Season’s Café and Chakra Restaurant. Residents of Johor Bahru can expect to see other heavyweight foodpanda partner such as Chicken Rice Shop, Old Town White Coffee and other great restaurants in the next few weeks. Currently orders are taken via their website and mobile application on iOS and Google Play. Foodpanda.my currently operates in the Klang Valley, Penang, Ipoh, Melaka and Johor. Foodpanda plans to make food delivery more accessible and convenient to as many busy Malaysians. They are looking to accomplish this within the next few months by further expanding in the Klang Valley and other major cities in Malaysia. Foodpanda.my is an online food delivery portal that connects hungry customers to the best restaurants in Malaysia. As the online food delivery leaders, foodpanda.my has more than 300 restaurants including international chains like Tony Roma’s and local favorites like Chicken Rice Shop. Providing a widest range of cuisines and the most number of food delivery restaurants listed online. With choices ranging from high end dining restaurants like Bombay Palace and Rama V, international flavors like Sarpino’s Pizza and Sushi King, local food chains like Chicken Rice Shop and Pappa Rich, beverages like Starbucks, Chatime and Denise Wines, to local favorites like Burger Bakar Kaw Kaw and Old Town White Coffee. Besides food delivery, foodpanda.my also offers food pickup and advanced pre-ordering services on their website. Foodpanda.my currently operates in the Klang Valley, Penang, Johor Bahru, Ipoh and Melaka. Founded in February 2012, foodpanda together with its affiliated brands hellofood and hungrypanda is the leading group of online food ordering platforms active in over 30 countries including India, Indonesia, Malaysia, Pakistan, Singapore, Taiwan, Thailand, Vietnam, Ghana, Ivory Coast, Kenya, Morocco, Senegal, Nigeria, Russia, Brazil, Chile, Colombia, Mexico, Peru, Hungary, Czech Republic, Rwanda and Jordan. It helps restaurants to increase sales through online and mobile platforms and provides them with constantly evolving technology and analytics. For consumers, foodpanda group offers an online marketplace with widest gastronomic range, including e.g. salads, pizza, burger and sushi. Consumers choose their favorite meal on the platform or via app (23 countries); foodpanda processes the order to the restaurant which delivers the meal to the doorstep. Worthy Book is available at all major bookstores (MPH, Popular, Borders, Times, Kinokuniya & myNEWS.com) in KL, Selangor, Penang and Johor. Worthy BookTM is a voucher booklet for freebies, deals and discounts at some of Malaysia’s most popular spots, ideal for your family, friends, colleagues and loved ones! Participating merchants in the Worthy BookTM Ladies Edition 2013-2014 include Baleno, Beaubelle, BeeBee Nail, b.liv, bluunis, bmic, b.seen, De’cleor, Ecoparadise, Himalaya, Jojoba Spa, Jurlique, Bio Jourdeness, Colour Culture, Kenko Fish Spa, Glow & Glamour, Le Sense Spa, Mary Chia, Melissachens Skincare, Nature’s Farm, New York Skin Solutions, Royale Spa, SINMA, Slimming Sanctuary, SOTHYS, Three Sixty Degrees, tns SkinLab, Treats, TT Mask, Vila Manja Spa, Xixili etc! For our latest updates and activities, visit our facebook page on http://www.facebook.com/worthybook or feel free to contact us at info@worthybook.my for more information!